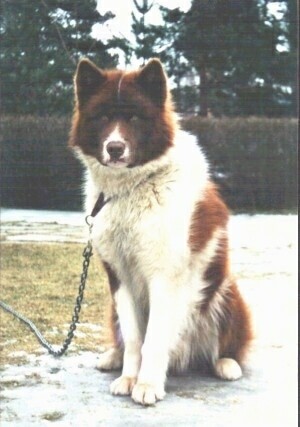 The Greenland Dog is similar to the Canadian Eskimo Sleddog, but is not as heavy and slightly taller. It has a thick stand-off outer coat and dense under wool, which allows it to withstand constant outdoor living in temperatures that can reach -50 to -75 degrees Fahrenheit. It has small triangular ears which rarely get frostbite. The head is robust, broad and wedge shaped. The jaws are extremely powerful. It has a large, bushy tail, which curls over the dog’s back and protects the dog’s face while it is sleeping. The legs are well feathered and the toes are thickly furred with large pads. Aloof and very independent, the Greenland Dog can be loving with an owner he bonds with. The breed remains principally a working dog. It has the typical Nordic, good, loyal temperament, but when the dogs work in teams, they do not have the opportunity to develop a relationship with one master. They are independent, self-willing, rowdy and boisterous in their play. This dog is not content to simply lie around the house all day long; the Greenland Dog needs to work or have some kind of vigorous activity. In recent times it has become more popular in Norway and Sweden as a hiking companion. This breed also lives with the Eskimos and shares the hardships the Eskimos face. They pull sleds and help with the hunt for bears and seals. They are usually friendly toward people and have no guarding or protector instincts, but their hunting skills are very developed. Training these dogs is very difficult and it takes a lot of firm, patient leadership to teach the dog the most necessary skills. This breed still retains a lot of wolf instincts and character. Their alpha pack instinct is very strong. An owner of a Greenland Dog must be very dominant and able to show the dog he is alpha. The dogs must accept the owner as the leader. This breed likes to roam. Greenland Dogs are also seen in dog racing with sleds or wagons. The Greenland Dog is not good for apartment life. It needs space, room to run and a job to do. This breed can live outdoors. It can withstand cold temperatures and does not like excessive heat. The Greenland Dog is not a breed to contently lie around your house. It needs to be taken on a daily, long brisk walk, and needs to have a job to do. While out on the walk make sure the dog heels beside or behind the person holding the lead, never in front, as instinct tells a dog the leader leads the way, and that leader needs to be the human. This Spitz-type dog has existed throughout the Arctic regions since antiquity. The ancestry of this breed can possibly be traced back to the dogs accompanying people from Siberia well over 12,000 years ago. As these people developed into Inuit of today, they may have used local wolves for father breeding. Greenland Dogs are fairly rare. Most people who acquire a Greenland Dog have imported them from Greenland or have taken one home from a visit there, or from friends who have been there. Very few litters are born.